This was the last working day of the week. We finished our courses and after lunch we headed to the docks just next to Magdalene College, where some punts were waiting for us. In case you do not know: a punt is some kind of rectangular boat which is driven by using just a single stick. It is quite similar to the gondolas that drive through the channels of Venice, except that you do not use a paddle, but a stick that goes to the ground of the channel in order to manoeuvre the boat. The way of steering such punts is quite sophisticated, if you have never done it before. People usually make fools out of themselves when they try it the first time. And so it was in our case. Either the stick was pushed too fast or in the wrong way so that the boat drove in the wrong direction, hit the border of the channel or, most likely, hit another boat that had the same problems. 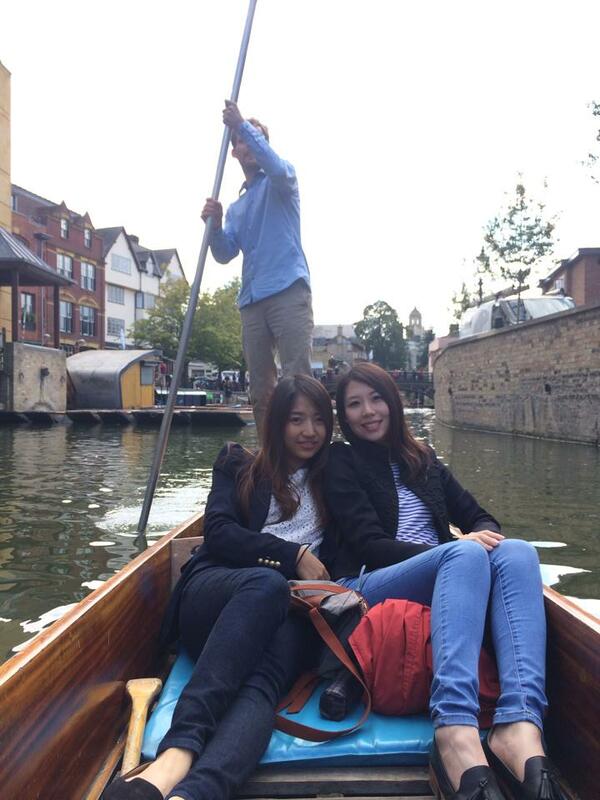 Perhaps in anticipation of the danger of being laughed at in a non-mean way or – rather – due to the fear of falling into the water, some nice Asian girls asked me to be the driver of their punt. Of course, I heroically agreed, although I did not really have a very good feeling about standing on the back of a small staggering boat. At least I got this long stick in my hands which could provide some assistance if I lost balance. But eventually it turned out to be good fun. After some initial failures I got the basic moves and had the boat under control as long as nobody else passed my way. After an hour we brought the punt back to the dock. And as we slowly went to a nearby café, I recognized how exhausting the trip actually was. One of my arms felt like it would fall off the very next moment, but that feeling went by and I enjoyed some tea and cake with the girls. In the evening, people gathered for the pup crawl. We left Cripps Court for are nearby pub just right up the hill, where we had our first drink. It was a relaxing atmosphere in which I became friends with some people I have not spoken to so far. Time went by quickly so that it was surprising that we already had to leave for the next bar which was in the centre of the city. There, socializing in the group and with the local population continued.